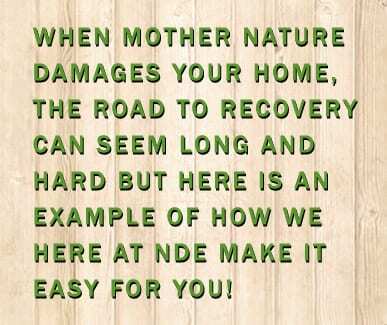 Whether your property has been damaged by wind or hail, you can count on NDE Inc. to help you through the claim process from start to finish. Most homeowners do not regularly climb up on their roof so it's understandable that many times a homeowner doesn’t realize their property has sustained any damage. Damage from hail stones are not something to take lightly. The damage that occurs will shorten the life span of your shingles causing your roofing systems function to fail prematurely. For many homeowners who have never made a claim before, this process can seem overwhelming, however, we here at NDE Inc. will work with your insurance company to make sure you are compensated for all damages to your property. If you have experienced a severe storm, call one of our claims specialists’ for a free assessment of damages. Upon completion of our inspection we will let you know if we have seen any damage that would warrant making a claim on your property. If you do need to make a claim, you will need to contact your insurance company so they can arrange for an adjuster to come out to do an inspection of the damages. This meeting is very important for us to attend, as we will want to make sure that you are compensated for all damages as well as upgrades due to building codes in your jurisdiction. Have you recommend us to others. The work began the week after we signed the contract. The work was done in stages and correctly by a wonderful crew. We would strongly recommend New Dominion Exterior, Inc. to anyone who needs roofing or siding done. They were here when the big company left us high and dry.